Could have sworn we already had a thread for this - search didn't find one, though. Detroit: Become Human is, of course, the latest game from Quantic Dream, and the mind of David Cage. When the PS4 was announced, QD revealed a tech demo showing off the power of the new console. It was pretty stunning. I'm pleased to confirm the entire game looks like that. It really is quite the spectacle. Outside of that, there's not too much more I can recommend it on, if you're the sort of person who sees the words 'David Cage', 'Quantic Dream', 'interactive movie' or 'walking simulator' and let's out and audible sigh. The story and writing is better than Beyond: Two Souls, and mostly better than Heavy Rain and Fahrenheit (ok, Omikron too). That doesn't mean this is suddenly an epic work that demands to be experienced. It says more about the faults of those other games - but this is a marked improvement. Having said that, it's not nearly as clever as it would like to be, or at times thinks it is. There are significant changes to the story you can make very early on. And by significant, I mean one of the three main characters can be killed off very early on. How many endings and such there are, I'm not sure, but each chapter ends with a flow chart of discoveries and decisions you made, or missed, similar to the system at the end of the Nonary Games trilogy. The mo cap and voice acting performances are amongst the best I've seen. What holds back the quality some what, or at least the judging of it, is that obviously this is a game about robots. And therefore the main cast perform in a robotic manner. Which is something of a shame, in an odd way. In short, if you liked the previous QD games as much as me (quite a lot), all you need to know is that so far, this is their best work. It still leaves me wondering where they go next, how much more pretty can they make it, and how much can they make a focused, interesting story that is simultaneously interactable and can change in ways that demand you play it again. For those undecided, maybe wait for the inevitable sale. I beat this in one sitting the night it launched, now for those thinking that means the game is short it's still 11-12 hours long (or more if you explore every scene). I started at 12am and finished it at 11:30am I was just that engrossed in the story that I couldn't put it down. 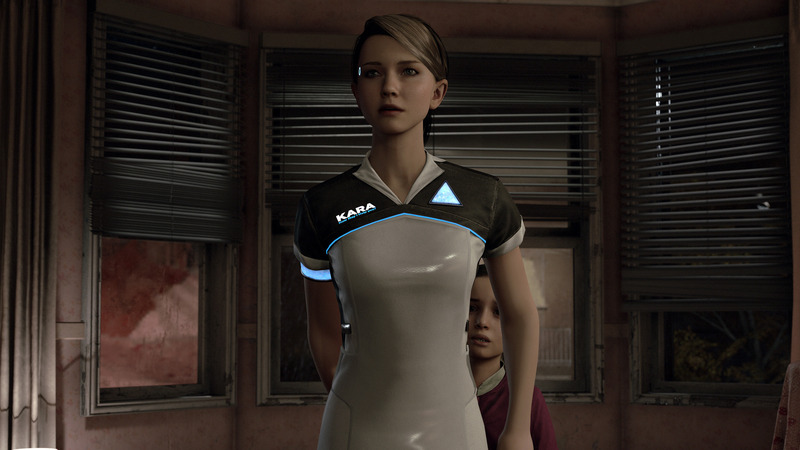 To me this is a David Cage's best work and I can't wait to see what he does next. The flowchart aspect at the end of every level is both overwhelming in scope, but absolutely awe inspiring that one scene could have so many divergent paths based on your actions. This game is the culmination of decades of work by Cage and his team trying to figure out how to make a game this ambitious work and I feel he achieved that goal. Played a few hours on Saturday before the POF . I can easily see this being played through 2-3 times. I'm just wondering if it's possible to kill all 3 main characters before the end. I'm just wondering if it's possible to kill all 3 main characters before the end. I can answer that if you want me to? I started at 12am and finished it at 11:30am I was just that engrossed in the story that I couldn't put it down. Well, I can fully understand this now. Simply put, you wouldn't usually stop watching a good movie half way through, so if you can get away with it, why stop this before the end? I went in expecting to stick a couple hours into it before going to bed, but once I got about 6 hours in I just had to see it through til the end. One of the best stories I have played in a while. It was the sheer the choice that gripped me the most, I just couldn't believe that so much could change. I know altering the narrative is David Cage's thing, but this game just makes every other game of his look 100% amateur by comparison it's impressive. Really enjoying this so far. Taking my time with it and trying to find as much as possible. Finished my first playthrough last night. Really enjoyed the story, very curious to just how different I can make it turn it out, specifically for one character whose ending wasn't particularly 'good' for me! I've been watching Jessie Cox play through this one on Youtube. It's an interesting story and the choices do look like they really make a difference. Played this a few weeks ago and was a wonderful experience! Thought the story and game play completely gripping and enjoyed the anxiety of each decision you have to make. Having the other half play it as well was interesting. She made a few significant differences and had a completely different game at the end. I will probably go back to it in due course to see what happens with other decisions. Haven't done a 'survivors' play through yet, but if I fancy doing it again, that's what I'll aim for. But then, I also wanted to do a play through (and trophy) where Connor dies at every single opportunity. There's a lot!